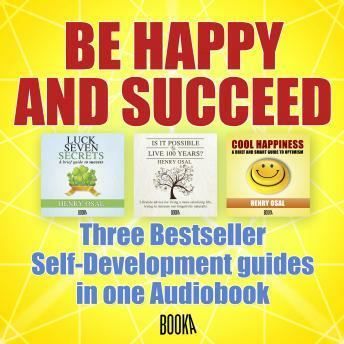 Booka Audiobooks and Henry Osal presents the audiobook " Be Happy and Succeed" . Three wonderful Self development bestsellers together in one audiobook . The greatest successes of Henry Osal translated into 12 languages No. 1 in over 10 countries and have sold tens of thousands of copies worldwide . Learn the secrets of luck , longevity and happiness in one volume at a great price . A unique opportunity to get three of the most succesful books in self development on digital platforms. Grab them , you will not be disappointed. In this short journey that we will go through together in order to be happier, to have a happier life, I only intend to help you discover YOUR HAPPINESS. Yes, yours, because just as YOU ARE UNIQUE, your happiness is unique and only belongs to you; so strange, so wonderful. Will you join me on this amazing journey to the centre of your happiness? So we start thinking about luck as something that we can control, as a path that we can choose in order to reach a goal. This requires paying attention to a series of rules, which I have called SECRETS, although in reality are just loaded with common sense. Let's walk together on this path. Lifestyle advice for living a more satisfying life, trying to increase our longevity naturally. I hope you find this as exciting to read as was collecting this interesting information has been for me, as I belong to a family with multiple cases of extreme longevity.